Psalmoetry – An Urban Inspirational recording artist from the State of Ohio whose Eclectic style ranges from Urban Gospel, Spoken Word, Neo-Soul/R&B, Hip-Hop/Rap, Contemporary Christian, R&P (rhythm and praise) and beyond. Her sound is known to put you in the mind of artists like Lisa McClendon, India Arie, Nicole C. Mullens, Lauryn Hill and Jill Scott to name a few. Focused and hard at work in the studio Psalmoetry (Ayanna Lewis) has been working to complete her new CD Psalmistic Soul Food and has already released a self-titled Urban project (Psalmoetry EP). She has also completed a music video and DVD for her HOT single (Shake it Off Remix). The Psalmoetry EP featured national recording artists Corey Red & L.G.Wise. Psalmoetry’s smash hit Single “Shake It Off!” landed her the number 1 spot on the Stellar award nominated Gospel Skate Jams Vol. 2 CD. She was blessed to also be featured on the Pursue Your Dreams compilation CD (another Stellar award nominee) which was used throughout the public schools of Kansas. To date, Psalmoetry has also released two life breathing worship devotional CDs, Joy In The Morning and I Know. These two devotional CD’s are a mix of R&P & Neo-Soul and bring spirit led poetry, song and scriptural exhortation together to minister to your soul! Most recently, she debuted her worship EP “Worship With Me” (a collection of some of her favorite praise and worship songs) which she first released at the Women Who Soar conference in Baltimore Maryland…a conference where she was the guest Psalmist. As a graduate of The School for Creative & Performing Arts (Cincinnati) – Psalmoetry studied Drama, Vocal Music and Dance. Ayanna is also graduate of SMTI (Supernatural Ministries Training Institute) where she furthered her learning of biblical scriptures and received a certificate in the Ministry of Helps. Her gifts and talents have been used in numerous musicals and stage plays as well as in the Christian film ”Segregated Sunday” where she played the role of “Minnie”. In 2013 Ayanna won the SafeAuto Do The Jingle contest where she had over 392k votes and 2.5k likes. Because of her win, the jingle (and the video she created for it) is now being aired on national TV through the country. She has also went on to do additional promotions for SafeAuto and currently can been seen on several billboards throughout Ohio. Psalmoetry (Ayanna) was also the 2013 Winner of the Wendy’s Coca Cola Freestyle Contest. Because of this, her winning jingle was aired repeatedly on Wiz Nation FM Radio and she was interviewed by DJ E.J. Geig and “Jam” (Jamila Carter). 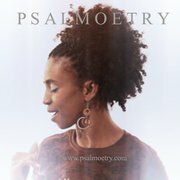 Psalmoetry was able to use both wins as a platform to give GOD all the glory! Ayanna (Psalmoetry) has several published works of Spirit led poetry and has ministered in the gift of “Spoken Word” and song at youth camps, church and outreach venues, in prisons, schools and for wedding and homegoing services. She’s been blessed to take part in such music tours as The Aquire The Fire Tour (Ron Luce) where she shared the stage with national recording artists The News Boys and others. For the Fuel The Passion Tour 2011 she was graced to share the stage with speakers, artists and bands such as Nikita Koloff (former WWF Champion), Jordan Armstrong, The School of Worship, Speak Life, and K-Drama. Psalmoetry performed live during GMA week for a music showcase in Nashville, Tennessee that featured such artists as Dottie Peoples, Group-One Crew, and others. Ayanna is in love with JESUS THE LIVING CHRIST and credits Him for specific changes that have been made in her heart for not only her betterment but to aid her in being a blessing to others. Psalmoetry says, ”I believe God has graced me with my writing and singing gift in order to encourage and inspire. Therefore, if I am going to write anything it will have to be life breathing”. Psalmoetry’s music has been said to be relevant and in a unique way expresses God’s genuine love for mankind. Beyond the music Psalmoetry has a dynamic way with words and has spoken at conferences such as My Sista My Friend (Annie Ruth), Life Choices (Author De’Ron Smith) and the annual Stop The Madness outreach (Saundra Cross Porter) to name a few. Ayanna is happily married to her loving and devoted husband Terrence “Chrisma” Lewis (two time Grammy & Stellar Nominated Producer) of Chrisma Productions and UrbanMultiTracks.com. She also enjoys spending time with their beautiful twin daughters Saida & Terren.